OMEGA’s LC321 Series compression load cell offers a broad load range, a threaded through center hole, and an ultra-low profile for easy installation. Its all stainless steel construction and rugged design assure long life and high reliability in industrial environments. Excitation: 10 Vdc, 15 Vdc max. 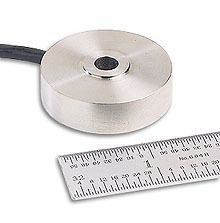 Nota: All LC321 series load cells come with a NIST traceable calibration certificate.